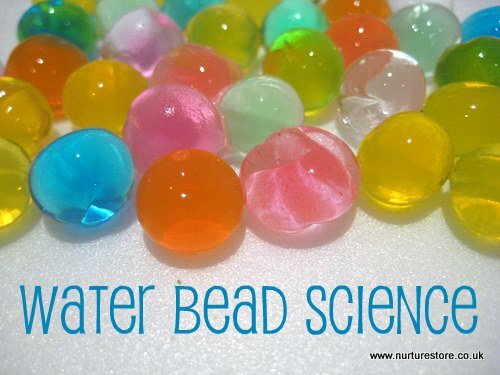 After ohhing and ahhing and wishing and dreaming every time we read a post from an American blogger, this week we discovered you can get hold of water beads in the UK. 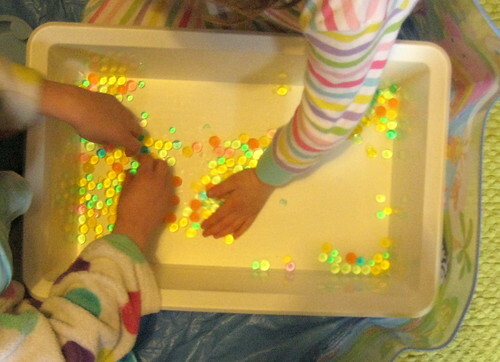 An order was placed, the water beads arrived and we were ready to play! The first thing that the children were surprised about was just how tiny the beads were when they poured out of the envelope. We talked about their shape, size and texture. Documenting science experiments with kids can be done in different way. Sometimes we write notes, sometimes we draw, today we recorded our investigation as a photo journal. 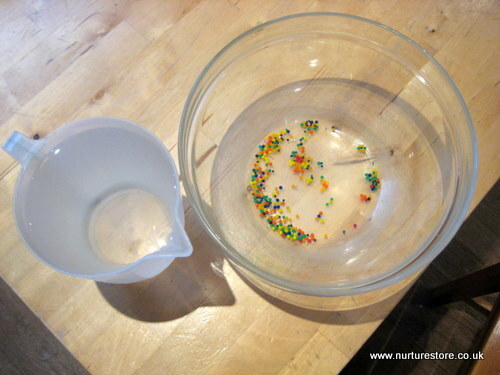 The next step is to add water, which was an opportunity to read the packet instructions, measure out exactly one litre of water and marvel at the enormity of the water in comparison to the tiny beads. 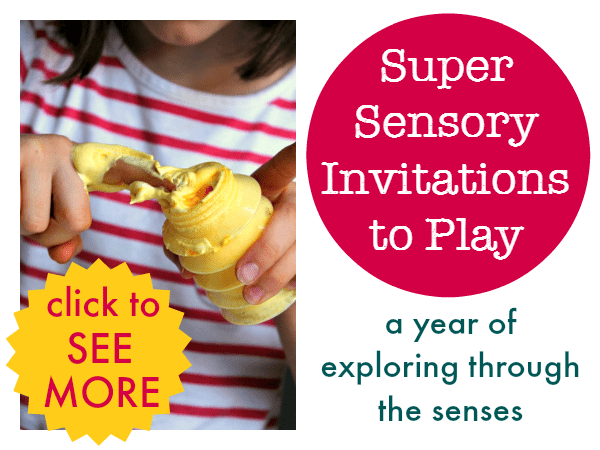 A little bit of awe in a science experiment is always good to build up a sense of excitment. The beads proved irresistible to everyone and we had lots of hand-on investigation. In the middle of the splashing and pouring we also paused to observe and describe that was happening to the beads. L said: Mummy, they’re growing like Jack and the Beanstalk. B said: No, there’s a special word for it. They’re absorbing. to beautiful wobbly spheres. So pretty and so tactile. I can imagine there will be lots of water bead sensory tubs in our future but today was about introducing the new material. Placing some of them in a storage box inside an empty paddling pool meant the kids could sit around and explore but the water beads were caught before they went skittering off across the room into the paws (and jaws) of our waiting cat. The children tested out the properties of the water beads and compared them to how they were when they started. Can they roll? Bounce? Squash? Go flat? Go back to the original shape? Stick together? Make a tower? Does anyone know what these are made of? Thanks! Rachel, They are described as a polymer, similar to contact lenses, which are non-toxic but not intended for ingestion. Looks like you all had so much fun! I have some unopened water beads waiting on the shelf to be used- can’t wait! we love these too. they are easy to get from wedding suppliers on Ebay! who ever invented these, struck on a winner!! 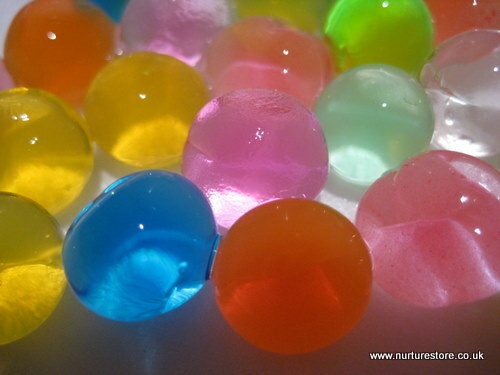 we heart water beads, cathy! i have to hide them from my 18 month old because it’s all she wants to play with all-day-long!!! Thanks for reminding me of this! 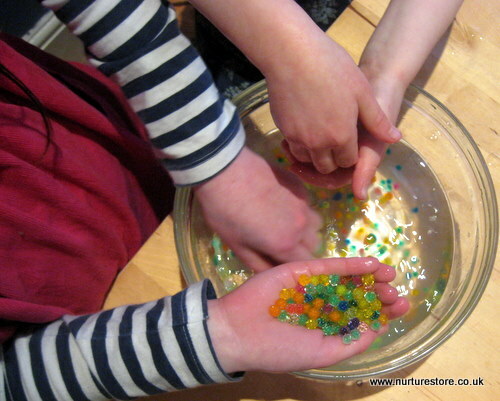 We haven’t played with water beads for a while – need to pull them out again! 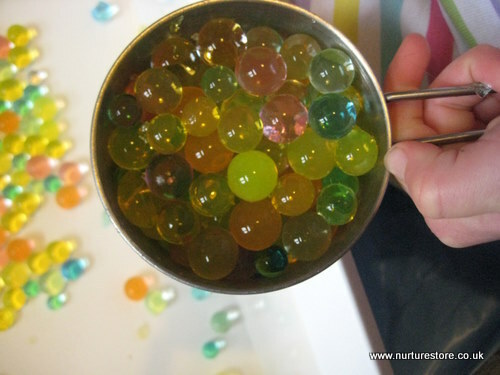 Our water beads arrived before Christmas and I have been pondering where the best place would be to reduce chaos! I had thought of leaving it until summer and doing it outside, so thanks to your post I have my solution, the paddling pool! great idea, thank you! I just ordered these still waiting for mine to arrive. I was first introduced to these two years ago when my 5th graders starting bringing them and trading them at school. I got mine from Orientaltrading.com so we’ll see how they work out (not always the best quality but cheap prices). We poor these in the bathtub and collect them in cups- great counting exercise. Playing with them in the tub means no slippery, bouncy little balls rolling around. We have the kitty problem too! I am so with you on enabling children to develop an enquiring mind and not worry abut getting the wrong results. There is so much pressure on that in the classroom and i fear it is all due to lack of time. A fabulous experiment and I shall be purchasing some beads! No Katie, I haven’t but I’ll have to track them down – they sound fantastic! Love the exploring, touching, feeling, observing going on here. 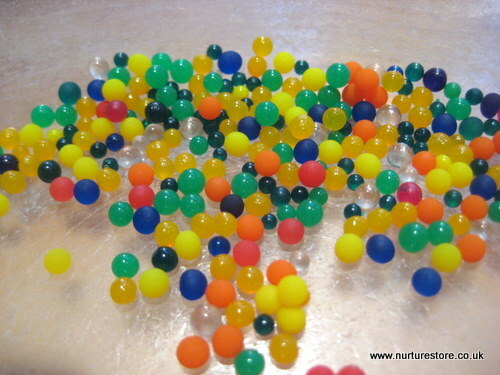 Water beads have been on my mind for some time now after seeing them all over the blogosphere. But, I wonder if we’l find them here easily. The hunt begins! Beautiful photos. We love photo journaling, too! 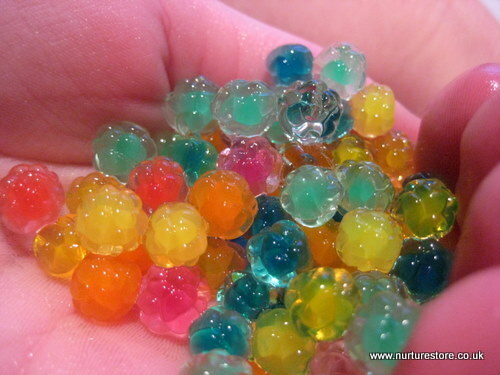 I have just ordered some water beads. Can’t wait for them to arrive now.I would love to be a part of Kids Coop and the pinterest board. Ooh TheBoyandMe, how exciting! Please report back on what The Boy thinks of them. My daughter loves these. She originally got them for Christmas in a product called Orbeez Spa (it was a foot bath thing, with these orbs). I eventually found them in the floral supply section of my craft store. I’m in America, so it might be different in other parts of the world, but try a floral supply for these expanding beads. We got clear ones from the dollar store…love that they seem to disappear in water because they have the same index of refraction as the water. Inge my girls really love that they disappear – very cool! As a sidenote, I’ve found that some fragrence releasers have little gel beads in them. We got some. Now they eventually dry up and end up looking just like those. So I added water to see if they’d come alive again, they did. Next I added food coloring cus the blue that they had been originally eventually started to dim and fade away to clear. The food coloring was absorbed ( I now have some really pretty purple ones to match the kitchen lol). What I’d like to do next is add some essential oils and see if I can use the old beads but give it a new scent. Figured ya might want the idea bout the food coloring and such. Dont you know, where I can buy it in EUROPE???? Thank you very much. What website did you order them from?? I love how strong and vibrant your colors are, the ones I have bought have not been that colorful! are they appropriate for 15 month-24 month old children in a child center setting? 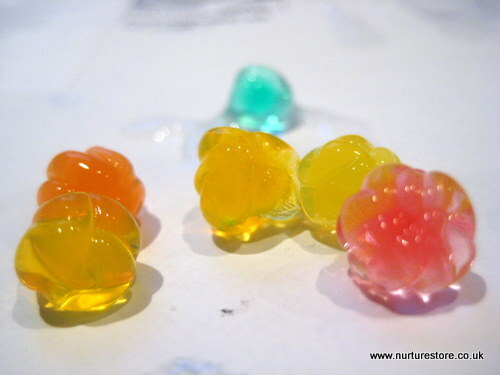 Make your own water beads by adding water to basil seeds, then add food coloring. I use large, instant tapioca from the Chinese Grocery store…$2.99 per bag. They are somewhat colored, but more color can be added via food coloring or dried Kool-Aide. If someone does eat one, it doesn’t really matter, since they are food-grade.